This page shows some of the frequently asked questions about Pocket-Monkey, Pocket-Monkey accounts, playing games, etc. If a question has a very quick answer, we show it next to the question in the list, but to get the full answer, click the question link to scroll down to the complete answer. Q. Will you charge in the future? Q. If you might charge in the future, why should I donate now? Q. What's the little monkey next to some people's names? Q. I'm using WebTV and my game boards look all messed up, why? Q. I had Java, but it's not working right now; how do I play my games? Q. How do your tournaments work? Q. What do I do if I forgot my username? Q. How do I change my player profile? Q. How do I change the site colors? Q. How do I put a player icon on my profile? Q. How do game timeouts work? Q. Why hasn't my game with XYZ timed out yet? Q. I'm going on vacation, what can I do so my games don't time out? Q. Why did my game time out?! I play every day! Q. How does the "Active Players" list work? Q. How can I tell if someone is online? Q. What is my Buddy List, and how do I add people to it? Q. How do statistics and the Top Players list work? Q. Someone's hassling me; what can I do? Q. How can I ignore a player? Q. Why does the word "null" show up in my games? Q. Why does the chat disappear in my games? Q. What happens if I resign a game? Q. What if I have a game I don't want to play anymore? Q. How do I cancel a game when there's no [Cancel this game] link under the board? Q. Is the forum moderated? Q. Why do some threads say they're closed? Q. How do I clear my Java cache? Q. Why do I get a 'Security Warning' when I play my games? Q. I can't type in-game messages, why not? Q. I'm having a problem not covered here, what can I do? Pocket-Monkey is a site that allows you to play turn-based games on the web. Unlike many other game sites out there, both players do not need to be logged-in to the site at the same time. If you are not online when when the other player sends you a turn, then we'll send you an email to let you know (although you can turn that off). Play as quickly, or slowly as you want, one turn at a time. If you want to know more about us, take a look at the About Us page. Pocket-Monkey accounts are currently free! But please donate to keep us running and help us develop new features! Q. Can I donate to Pocket-Monkey? Very kind of you to ask! Yes, we very happily accept donations! They're vital to keeping us running and helping us develop new features! Pocket-Monkey will always have some level of free access. We think that's important and we're committed to it. At some point in the future, we may introduce paid memberships with different usage limits, or some premium features that are only available to paid members, that sort of thing. Or we may not. For the moment, we're working on a pure donations model and we're hoping it goes well. First and foremost, because we need your support! Pocket-Monkey takes time and money to run, and it doesn't make that money from the ads (far from it!). Running a web site like Pocket-Monkey is expensive. And don't worry, if we change how we do things, naturally we'll handle that transition properly. is the Friend of Pocket-Monkey badge! It means that the player has donated at a certain level within the past year, and/or supported us by donating their time. Q. Do you support WebTV? Yes indeed! We even detect that you're connecting from WebTV and modify our page layout on important pages (like the game play page) to make it friendly to WebTV display and navigation. Move down to the Browser Type field and choose "WebTV/MSN-TV (not Java-enabled)"
That's it! Now the system will show you the WebTV-optimized pages even if the auto-detection doesn't catch that you're using WebTV. Q. Do I need Java to play games here? No, we have both Java and DHTML (non-Java) versions of all of our games. If you have Java installed and it's enabled in your browser settings, we'll give you the Java version of the games. If you're on WebTV, we'll automatically notice that and give you the DHTML version. If you're using something other than WebTV and don't have Java, just choose the appropriate option from the "Browser Type" setting in your Player Profile. In general, if you can use Java, it's better if you do -- moves are faster, the DHTML games have some issues the Java games don't, and there are one or two features which aren't yet supported in our DHTML games. If you're using a computer (rather than WebTV or a PDA), you can almost certainly get Java in order to get the benefits of playing using the Java games -- get the most recent Java from the official Java website. See this FAQ entry below. Q. Are there any limits to how many games or turns I can play? Nope! Pocket-Monkey is currently an entirely free site: You can have as many games going as you like, and make as many turns a day as you like. Someday, we'll have both paid and free accounts and at that point we will probably introduce some limits on the free accounts, but for now there aren't any. Note that we'll always have some form of free access to Pocket-Monkey, even once we introduce paid accounts. Q. Do you require a valid email address? Yes, you must give us an email address where we can reach you (e.g., where you really receive email and which you check regularly), and you must keep that address up-to-date if it changes. We do not share your email address with anyone; see the next question..
Q. Do you share my email address with anyone else? Q. Do you have tournaments? Yes! Click here for the list of current tournaments, or click here for the Tournament Help page. You can sign up for a tournament when it's in its "signup" stage. Once the tournament starts, it will match you up with your opponents for the first round and create the games. When that round of games finishes, the players who survive the round will move on to the next round automatically, etc. For more details, click here for the Tournament Help page. Click this link to use your username to have the site email your password to you. Click this link to use the email address registered on your account to have the site email you your username. Sorry to lose you! Contact us and let	us know that you want to cancel your membership. We will email you for confirmation. You can only cancel your membership using the email address listed on the account. Be sure to click the Update button! If you don't click Update, your profile isn't updated (e.g., your changes aren't saved). If you change your email address, the site will email you a confirmation of the change. You must confirm the change using information from the confirmation email within a few days. Be sure to click the Update button! If you don't click Update, your settings aren't changed! Pocket-Monkey will email you a confirmation message when you change your email address, with a code you can use to show you got the confirmation message. To choose from our various color themes, click Settings on the tab bar, then click Color Themes from the menu on the left. That will list all of the color themes -- just click one to try it! The change is immediate. Do not use someone else's copyrighted material unless you have written permission to use it. Most of the graphics you find on the web are copyrighted and using them without permission can get Pocket-Monkey in trouble. Think Small!! If your player icon is more than about 200 pixels wide by about 100 pixels tall, it may dominate pages inappropriately for people with smaller screens. If we get a complaint that your icon is too big, we may have to remove it. Note that most "free gif" web sites allow you to use their images only if you post a link back to their site on the page(s) where the image is used -- e.g., advertise for them. (Fair enough.) Since you can't do that on Pocket-Monkey, you can't use images from those sites. Note that many of these "free gif" sites do not allow you to link directly to the image on their site; to use it, you must download it and host it elsewhere. This is because image hosting takes lots of network bandwidth, which is expensive for them. Be sure to check the policy of the site before you use images from that site. If your icon doesn't appear but you're sure you have the URL right and you're linking to an image held elsewhere, it may be that the site hosting the image won't let you use the image that way -- they can check what page the image appears in when the browser tries to show it in the page, and deny use of the image if it's not in one of their pages. Always read the terms and conditions if you're using someone else's image, even "free gif" sites will frequently have restrictions on how you can use their images. You may have to copy the image and host it somewhere else (provided, of course, that the site you're getting the image from allows that!). Q. Do games have time limits? Yes. Once the time limit has been reached the game may time out (see below). If a game times out, the player it was waiting for loses and the other player wins. You're in control of the time limits. See How do game timeouts work? below. When you start a game, it has a time limit for moves -- 1 day, 3 days, 7 days, etc. This determines the "Must Move By" column on the Current Games page. When you make a move, your opponent has X days to make a responding move. Once that time limit has passed, the game becomes eligible to time out (unless the game allows vacations and the player is on one). It doesn't actually time out until The Gorilla comes by and does it. What's The Gorilla? The Gorilla is an automated process which runs periodically throughout the day and deals with games that have gone over their time limit. Only when The Gorilla actually ends the game has it officially "timed out." Sometimes The Gorilla runs less often than normal for whatever reason (perhaps we're doing maintenance on the site, etc. ), and sometimes it even skips an entire day. If a player manages to get a move in after the game becomes eligible to time out but before The Gorilla gets around to it, well, that's lucky for them -- the game continues as normal. We do not go back and time out games that "should" have timed out but didn't because, for whatever reason, The Gorilla didn't get to it quickly enough. Our official definition of a game timing out is it being past its "must move by" date and The Gorilla ending the game. Normally, the timeout interval for the game is set when you start it and stays the same throughout the game. However, you can ask your opponent to agree to a change to the time limit, see Can I change the time limit of a game? below. Q. Can I change the time limit of a game? You can for non-tournament games, yes, if your opponent agrees to it. (Tournament games have fixed timeouts.) To do that, click the "[Change Time Limit]" link under the game. This will take you to a page where you can set a new time limit and write a message to your opponent saying why you want to change it. Once you send the message, it will go to your opponent. If your opponent accepts the time limit change, the site will change the time limit on the game. Remember, though, that your opponent is not obligated to change the time limit -- he/she can decline, which means the old limit will stay in place. Most people accept time limit changes, though -- we're here to have fun, not to be difficult! Either because the other player is on vacation, or because The Gorilla hasn't gotten around to it yet. See How do game timeouts work? above. Q. The Gorilla didn't time out a game and my opponent moved late, can I have you time it out? No, we don't go back and time out games. See How do game timeouts work? for more. You have a couple of options available to you. You can schedule a vacation by going to your vacations page (details on the vacations help page here). While you're on vacation, your non-tournament games won't time out and games in tournaments that allow vacations won't time out (tournaments that don't allow vacations will time out as normal). Alternately, for your non-tournament games, you can see if your opponents are willing to extend the timeouts on the games. A 30-day timeout, for instance, is sufficient for most vacations. There's a link under the game board for asking your opponent to change the time limit. Please note that they're under no obligation, although most of the people who play on Pocket-Monkey are very nice and say "Of course!". For your tournament games, again if the tournament supports vacations you can schedule one; there's nothing you can do about games in a tournament that doesn't support vacations other than trying to play as quickly as possible to build up grace time (but even that won't help if you're gone longer than the hard time limit). Q. I just barely missed a game and it timed out, can you restore it? Ouch! That hurts. But no, we're afraid we can't restore timed-out games, even if you just missed it by a few minutes. After all, the game did time out, and with the way The Gorilla (above) works, usually you do get a few extra minutes anyway. If you play games with very short time-outs (for instance, one-day games or UltraFast tourney games), even if you play "every day," it's really easy to be away from the site for more than 24 hours. You play at 9:00 a.m. one day and head out for a day of errands, you're out to dinner that evening with friends, and the next morning you have an early appointment and don't play until noon or 1 p.m. -- and boom, there you are, you've been gone long enough (27-28 hours) that a game times out if your opponent happened to move right after you left. If you think a game timed out on you before it should have (which has happened exactly once since Pocket-Monkey started -- the result of an admin error we saw and corrected [restoring the games] before anyone noticed), it's easy to check: Review the game time limit, and then go into the game and click the Show Game History link under the game board. At the bottom, you'll see when your opponent made their last move and, under that, a line saying Game Ended followed by the date/time the game ended. If you've reviewed that and you still think the game shouldn't have ended, free free to ask us to take a look at it by dropping us a note via the Contact Us link and telling us the game #, when the last turn was made, when the game ended, and why you think it shouldn't have. We'll take a look and come back to you. But again, games don't time out prematurely unless there's some kind of admin error, which has only happened once, several years ago. If a player has logged in or sent a turn within the last five minutes, then their name will appear bold in your list of current games (and various other player lists on the site) and in the game itself. You can also check out the Active Players list on the Games tab to see who's around. The Buddy List (on the Players tab) is a list of people you know on the site. This list makes it easy to invite people you already know to games, rather than your having to go digging through the Player Directory every time. Your buddy list can also have notes next to your buddies. (If the site adds someone to your buddy list automatically, it will include a note saying why.) On the Buddy List, you can click the "[Start Game]" link to go to the Game Invite page with your buddy already listed as the "to" player. You can also update the note on your buddy, or remove someone from the list. Your list of buddies is also included on the Game Invite and Send Message pages as a drop-down list. Q. When it's my turn, will you notify me? Yes, if you like. For full details, check out the section on notifications (below). The statistics page has its own help here. Tell them to stop hassling you. This is quick and easy and it usually works. If you have a game going (or you get paired up in a tournament at some point), you don't see the other player's in-game chat and won't be able to send them chat in that game. If putting the player on your Ignore List doesn't work (e.g., they're hassling you publicly in the forum or something like that), please contact us to let us know, and we'll deal with it (please be sure to be specific about how and where they're hassling you). Go to their profile page, typically by clicking their name somewhere (almost anywhere you see a player's name on the site, it's a link to their profile). Near the top of their profile page is a link saying "Ignore (playername)". Click that link. The site will take you to your Ignore List and fill in that player's name in the "Ignore player:" box (near the bottom). Double-check the name, optionally fill in a comment to remind yourself why you're ignoring this player, and click the "Ignore Player" button at the bottom. The list will refresh and there will be a message at the top confirming that you are now ignoring that player. You can review your Ignore List, take people off of it, put people on it, etc., at any time by clicking Settings | Ignore List. The non-Java games have a problem where sometimes the word "null" appears in the chat area for no apparent reason. It's not that one of the players actually said "null", it's being generated by the game itself. We're replacing our non-Java games and this problem will be fixed when we do. Until then, please just ignore it. (Note that even if you use the Java games, your opponent may be using the non-Java games. The non-Java games have a problem where sometimes the chat is wiped clean. On some users' systems this happens every turn, on others only sometimes. We're replacing our non-Java games and this will be fixed when we do. Until then, we apologize for any inconvenience. If this problem happens to you and you're the player using the non-Java games, as far as we can tell you can reliably chat with your opponent by doing the following: When you go into the game to take a turn, look at the chat area right away for a message from your opponent, because that message may get erased as you make your move. Then type your reply after making your move and just before clicking the Send button (if you type it earlier, it may get erased as you make your move). If you find yourself in a game with someone you don't want to play with, naturally you can always resign -- remember that resigning always means your opponent wins, no matter how early in the game you resign. However, right at the beginning of a game, if you find out that you and your opponent just don't get along, you might be able to cancel the game. A cancelled game doesn't count at all; it's like you never started it. If a game can be cancelled, there's a "Cancel this game" link underneath the game board (if the link isn't there, the game can't be cancelled). Clicking the link presents a confirmation page, and if you confirm, then the game is cancelled. Note that Tournament games can never be cancelled. You can't. Once a game has a couple of turns (the exact number depends on the kind of game) it cannot be cancelled; if you really want to stop playing, you'll have to resign -- see "What happens if I resign a game?" above. Q. Do you have a discussion area / forum here? The Catchall Cafe - A general-purpose discussion area for keeping in touch with people and just chatting about things generally. Games : Backgammon - You guessed it -- a place to talk about all things Backgammon-y! Games : Lines - ...and games like Mill, Four-in-a-Row, Gomoku -- line-oriented games. News & Announcements - A place for official news and announcements from the Pocket-Monkey staff. Only PM staff can create threads here, but anyone can comment on them. We post things like planned upgrades, etc., here. Very gently, yes. As in most places, people are free to express their opinions in the forum, but not completely free. There are some things we discourage. For instance, "flame wars" ruin game sites, and we don't allow them here, so anything which is likely to incite a flame war is not okay -- personal attacks on people, racial comments, strong political or religious comments, etc. Pocket-Monkey is a friendly little place to hang out and play games, not a platform for discussing or advancing particular social, political, religious, or other views. Strong discussions of that nature can make a site feel unfriendly, particularly if one side of a discussion has more vocal proponents than the other side. Consequently, on the rare occasions where it looks like something may be getting out of control, we step in with a polite word asking people to tone it down and/or leave it. If doing that a couple of times doesn't work and if it's warranted, we'll close a thread so people can't post to it further. On extremely rare occasions we've had to remove threads entirely, but we treat that as a last resort. We're very gentle in our forum moderation, and we've only ever had to moderate quite rarely and only had to go to the last resort a couple of times. Threads get closed automatically if they've been inactive for a while. Separately, on rare occasions the Pocket-Monkey administrators may close a thread early if it's becoming problematic (see the previous question). Finally, some of the announcements in the News & Announcements section are just announcements and so the thread starts out closed. There are a couple of reasons this could happen. If you're using Windows (or even if you're not), the first thing to try is a reboot. Sometimes that clears up weird problems. If that doesn't do it, most likely either your browser cache or your Java cache has gotten messed up somehow. To rule out the browser cache, if you're using Windows, try going to a game and pressing Ctrl+F5. That's kind of a "super" refresh button, which sometimes works out the problem if it's your browser cache. If that doesn't work, try clearing your Java cache. If that doesn't work, there may be a problem with your Java installation. It might be worth completely uninstalling Java and then installing the latest update of Java 6 (not Java 7) from this page (you want the JRE, not the JDK). Open the Java Control Panel: If there's a coffee cup icon in your system tray, right-click it and choose "Open control panel" (if you have a recent version of Java). If there is no coffee cup, go to the Windows Control Panel and choose the Java item. Find and close all open browser windows. All of them. Don't leave any open. This is important, so please double-check that you don't have any open. Java 1.7 (aka "Java 7"): You'll see a dialog with three boxes on it, the bottom box being called "Temporary Internet Files" (this is the cache). Click the Settings button. In the dialog box that comes up, there's a Delete Files button; click it. In the dialog box that comes up, make sure that all three of the checkboxes are checked, and click OK. Then click OK again to exit the Temporary Files Settings dialog. Java 1.5 & 1.6 (aka "Java 6"): You'll see a dialog with three boxes on it, the bottom box being called "Temporary Internet Files" (this is the cache). Click the Delete Files button. In the dialog box that comes up, make sure that all three of the checkboxes are checked, and click OK.
Java 1.4 & earlier: You'll get a wide tabbed dialog. Go to the Cache tab. Click the button that clears the cache (it's "Delete Cache" or "Clear" or something like that). After doing that, the first time you go to a game, it may take a moment because Java will have to download our applet again, but after that it should be quick because it will reuse its local (cached) copy. Until you get the problem resolved, you can use the DHTML (non-Java) version of our games. Click Settings to change your player profile, type your password into the "Current Password" box (just to prove it's really you), change the "Browser Type" setting to "Web Browser (without Java)", and click the "Update" button at the bottom of the page to save your changes. In general, if you can use Java, it's better if you do -- moves are faster, the DHTML games have some issues the Java games don't, and there are one or two features which aren't yet supported in our DHTML games. By asking you before running applets that you haven't told it you trust, the plug-in is protecting you from applets you might run across just during normal websurfing, including ones designed to try to exploit flaws in Java. Before you even see the warning above, your browser might check with you that it's okay to run the Java plug-in. So with some browsers, you get two levels of protection: The browser asking about the plug-in, and the plug-in asking about the applet. 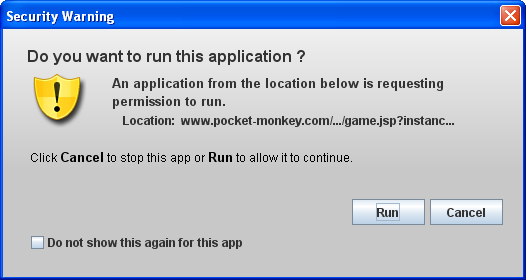 Obviously, Pocket-Monkey's applet doesn't try to exploit any security holes in the Java plug-in, so it's okay to tell Java that it can run our applet. If you don't want to be nagged every time you go into a game, you can tick the box labelled 'Do not show this again for this app' which adds Pocket-Monkey's applet to your Java installation's list of applets you trust. (If we update our applet, it'll probably start asking you again; just tick the box again if that happens.) If your browser asks you before running the Java plug-in, it will offer a similar 'always run Java on this site' option. Pocket-Monkey also provides a non-Java version of our games, see the question above for how to set your account to use those instead of the Java ones. But be aware that our non-Java games have some issues, if you can use the Java ones, we recommend that you do. It's not your turn. You can only type in-game messages when it's your turn, before you click Send. If that's not it and you're using the Java games, you may be running into an obscure problem with the Java plug-in: Sometimes, when the game is first shown, although your cursor is shown in the message area, typing doesn't do anything. If this happens, just click the mouse anywhere on the page outside the game board (just to the right of the message area, for instance), and then click in the message area again. Usually that clears it up, sometimes you may have to do it twice. But usually that clears it right up. Q. Can I suggest a new game or feature for the site? Yes, please! We're always adding new features and such, and we have a To Do list with lots of things we're working on. Just drop us a note via the Contact Us link, and thank you in advance for the suggestion! Drop us a note via the Contact Us link, and we'll reply via email. Please be fairly detailed about what's going on how it differs from what you expect. If you're writing about a problem in a specific game, please be sure to include the game number, which is shown underneath the game board (there's a handy link there called "[Contact us about this game]" which will include the game number for you).